These lines I have always taken to be the poet’s take not only on how nature heals and cures you, but also of how memories, seen and unseen, deep-buried to where you can scarcely summon them, continue to shape and define your days like a form of imaginative karma. And so it was that two trips to one of the most revered sites of pilgrimage, spaced only a few years apart, shape me these days as I come to the place for a third time—this time entirely in memory and reconfiguration. I discover new lessons in those old journeys, and how a pilgrimage might shift and move within your thoughts until it is equally immediate, equally vivid, but meaning altogether something different from what you had expected it would mean. Let me begin with the second time there. It was, in many ways, a marked improvement over the first. I was years wiser, had ended a bad marriage and embarked on a second that, to this day, remains the best journey I have taken. I was riding the crest of my most critically successful book, Arcady, and was literally commuting to London, where I dined with editors and relaxed into seeing the London I had wanted to see on the first trip. 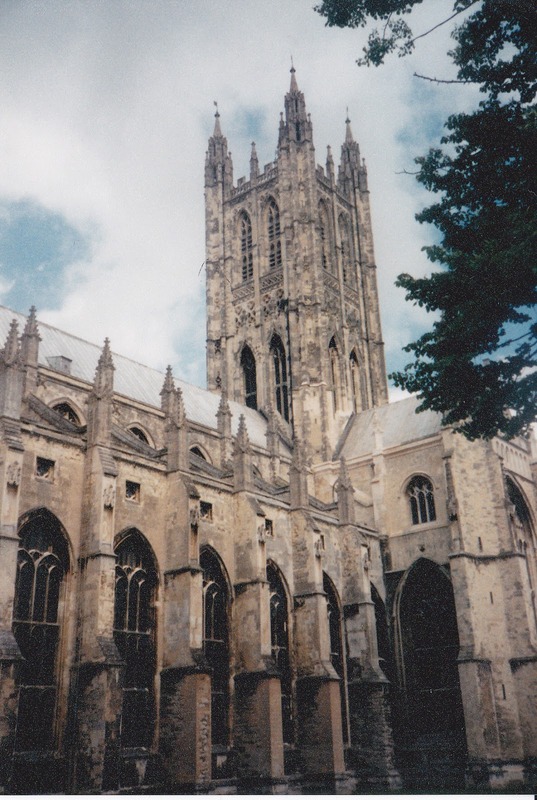 Canterbury was a tranquil spot after these hectic days, and we had a room that overlooked the cathedral close, so that the mornings were peaceful as well, and quietly beautiful, the soft, glassy ringing of bottles unloaded on doorsteps by the milkman, and the bells beginning at a courteous hour, when the sun was fully up and we were, too, on our way to visit the pedestrian-friendly streets around the cathedral. We saw the Cathedral, and I remembered a special fascination with the tomb of Edward the Black Prince, whose very militant Christian tomb was undermined by the mourning faces of “green men”—Celtic vegetation spirits whose presence on Edward’s catafalque were touching and at the same time rather funny, even though they seem to weep over his death. A death, by the way, that arrived a bit too soon. 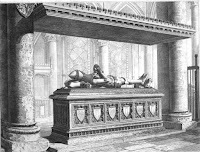 Edward ruled as the longest Crown Prince in British history: serving ably, at times even brilliantly, commander in victories over France in Crécy and Poitiers, he died a year before his father, and for all his service, for all his place in the line of succession, never became king. Perhaps the sculptor who carved the green men did so not only in a spirit of mourning, but also in an awareness of the rich irony of things. For the time of the green men was over. No doubt they never saw it coming. They receded to forests, to moonlit crossroads, to catafalques where they teased the One True Faith of the Black Prince with their leafy presence. But theirs was not the only cultural subversion I saw in Canterbury. High on one of the arches is unobtrusively carved a naked woman in a rather compromised posture. The story goes that the carving was the sculptor’s revenge for having been stiffed in payment. Or so David Mitchell told me. Yes, the David Mitchell. Cloud Atlas, The Bone Clocks, among a number of brilliant books. One of Britain’s visionary young novelists, who is no doubt headed for literary immortality as I write this. He was “Dave” to me, though, on my first trip to Canterbury, where he was a clerk at Waterstone’s, to whom I happened to mention that one of my books was sitting on the shelf not that far from the cash register. days. I talked to Dave briefly, and then he asked me to join him for dinner and some beers with several of his graduate school friends from the University of Kent. He was nice and gracious and very, very smart, so it seemed like a fun possibility. I joined Dave, then, and his friends Matt and Martine, for a graduate school fare of beer and pizza, and for happy conversation that lasted into the late hours. I remember being flattered by their attentions—partly because being regarded as a professional novelist was new to me, and also because at home, the full-time faculty and the graduate students I brushed against in the university were dismissive of fantasy fiction, and it was the first group of academics who seemed to believe I had street cred. All in all, it was a friendly encounter with some good college kids. Matt and Martine seemed to be a couple, and Dave spoke lovingly of his girlfriend in Japan. We parted happy to have met each other: Dave and I both agreed that our chance meeting and hours together had been the highlight of our summer. We would correspond briefly after I returned to the States, but like 99% of overseas encounters, we lost touch after an exchange of a couple of notes. Until, of course, I made the connection between the ardent, bright student and the novelist he had become. And for a few days at first I was, I hate to admit, a green leafy face of envy. You see, David Mitchell has my job. The one I had in mind for myself years ago. A serious writer (and by any definition he is that) and one who has been able to make more than a living from his work. A house in Ireland, a way of life that seemed to me glamorous when I began to write, and still has an enticing gleam to it as I write this. But it never happened with me. Thirteen novels now, some well-reviewed, but farther from making a living than seemed possible when that first book, Weasel’s Luck, was released to sales I never expected, even in my pipe dreams. By the standards I set for myself almost thirty years ago I’m a failure: mid-shelf writer, untenured professor subject annually to the budgetary whims of a finance-strapped university, passed over for promotions on several occasions. Was I not smart enough? I ask myself. Not talented enough? Too lazy? Unlucky in where I grew up? Unwise in my professional choices? Probably yes to all of these questions. So much for the visions of a young man—how the life turns from what you thought it would be to what it is. I think that if any of us looked back thirty years, dredging up the images of our ambition (“What will you be like 30 years from now?”), we all aim high. But we’re aiming at the wrong thing. Notice I said that my envy lasted “for a few days.” After which, I faced some hard truths. David Mitchell’s artistry and hard work have won a deserving place in life. Something in myself or my circumstances gave me my road, my station today as a writer. And what is important is the process of delight in the work: I still love putting words on the page, teaching students in a classroom. And if that work goes unacknowledged, that’s not what is important finally. If you’re the Black Prince and not a king, there’s more than enough glory in your battles and your victories. If you’re not a prince but a feudal peasant, same rules apply: your battles and victories remain your own, so fight the good fight and enjoy the combat—physical, mental, imaginative, spiritual, no matter the terrain. At one level the green men’s presence may mock you, but at that level they mock us all: in the passage of years all works vanish, and I realize it’s up to me to do the work given me, to do it when and where it matters. I never stopped wishing David all the goodness he seemed and seems to deserve. I celebrate him and his next novel. I know the forest beckons, that eventually all green men go back and hide, but I’m in this goodly light for a while to come.